Travel guru Johnny Jet, the mastermind behind JohnnyJet.com, has made a living traveling all around the world and sharing his experiences, tips and tricks with his readers. He’s been all over, from Singapore to Europe to Hawaii, and claims to spend more time in airports and jets than anywhere else in the world. So when we found out that Johnny once suffered from an intense fear of flying, we were more than a little intrigued. When Johnny was 17, he was given a lot of medication to help treat his asthma. And when the doctor said that he “might have a problem breathing on a plane because the cabin is pressurized,” he was immediately afraid to test out the claim. For 3 1/2 years afterward, he was terrified of flying. When he was 21, he started dating a girl who flew quite a bit. She invited him to Singapore, but he ended up passing when fear got in the way. But when she invited him to Hong Kong the following summer, he decided to ditch the meds and conquer his fear. From then on, he was hooked on travel. There was one obstacle when it came to flying to Hong Kong. The girl he was going with only flew Business Class, and Johnny didn’t have the budget for that. So he searched a consolidator site and was able to find a fare that was normally $5,000 for a mere $1,500. And he ended up earning enough miles on that trip to pay for another domestic trip in the future. I realized that I knew more than the guy presenting, so then I asked if I could do it with him the next year. And we had standing room only for the next few years. When people started asking to join his email database and insisted that he create a newsletter/website, he finally took the plunge and created JohnnyJet.com. I had nothing to sell. Most websites out there were trying to sell their own products. My goal was just to get people out there to see the world. Trying to get people to do it cheaply, safely, and [while having a lot of] fun. In no time, word about JohnnyJet had spread. People started calling for radio and television interviews, and someone even asked if they could write a book about his site. When USA Today wrote about him a few months later, the site truly took off. And in 2012, Johnny was on a Travel Channel show called Hotspots 2012. 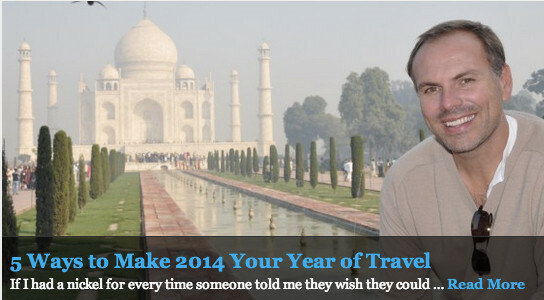 Now, Johnny shares travel tips from his site with just about 50,000 travel-loving subscribers. Johnny has more favorite travel spots than he can recall, but some of his favorite places to go are Europe in the summer and Southeast Asia in the winter. He’s also fond of New England during the warmer months. But in terms of a single travel experience, he has no problem coming up with a favorite among them. As is typical with these freak fares, the airline caught on quickly and the deal was down within 15 minutes. But if you’re in the know and stay on top of newsletters like Johnny’s Deals newsletter, you might get lucky and score the deal of a lifetime. Johnny’s other piece of advice for fellow travelers who accumulate miles is to use them as fast as possible. Miles can eventually get devalued, as is the case with miles from United and Delta. As of February 1st, they’ll be devaluing theirs. So take Johnny’s advice and make sure you get as much out of your miles as possible while you can. Johnny is no stranger to running giveaways. He typically runs them every two weeks with the main goal of giving back to his readers. “But it’s also nice to pick up new ones as well,” Johnny says. On JohnnyJet.com, you’re likely to find all-inclusive trip giveaways, from airline tickets to anywhere around the world to a stay at the Four Seasons in Las Vegas including dinner, a massage and tickets to Cirque du Soleil. Travel fanatics flock to these kinds of giveaways, and Johnny is a big fan of how PromoSimple makes it easy to pick up these new readers. I love how I can create all these extra options so people can get extra bonus entries by following me on Twitter, Instagram and Facebook. And they can also basically Tweet an advertisement saying ‘hey, I just entered this contest, and you can too.’ So it’s a great way to pick up new followers. Of all of the entry method options though, Johnny’s most valued one by far is the newsletter subscription option. He loves to pick up new readers and his newsletters are most definitely his favorite method for communicating with his audience.